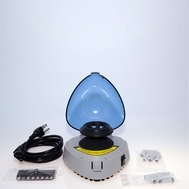 Small footprint personal centrifuges are a must-have tool for every laboratory bench. Each centrifuge is supplied complete with a rotor for standard microtubes and adapters for smaller tubes as well as a rotor for PCR strips and individual 0.2ml tubes. Dr. Spin centrifuges are perfect for a variety of applications, including quick spin downs, microfiltration and low speed separations. Operation is extremely easy - simply close the lid and the rotor accelerates quickly to 6000 rpm.